Gal Gadot is Wonder Woman on screen and off. 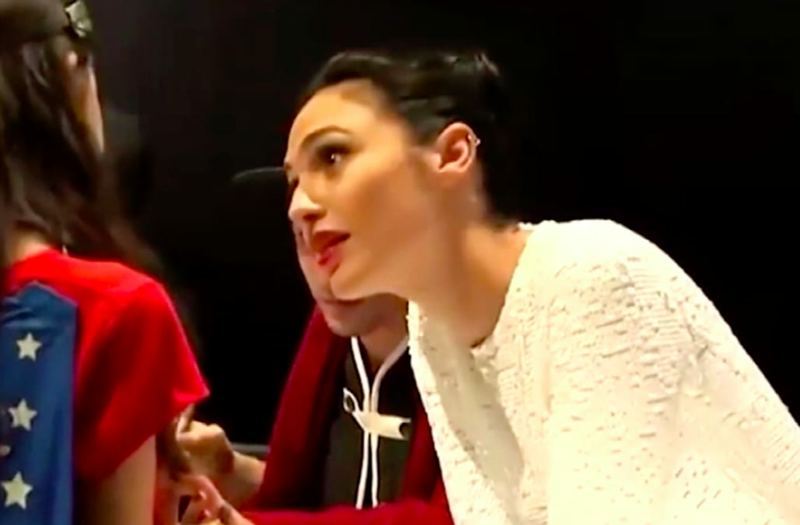 While signing autographs and meeting fans during a Justice League panel at San Diego Comic-Con on Saturday, the 32-year-old actress shared a sweet moment with a young fan dressed as -- you guess it -- Wonder Woman. NEWS: 'Wonder Woman' Sequel Officially Confirmed at Comic-Con! The little girl appears to be teary-eyed while approaching the star, and Gadot wastes no time before grabbing her hands and flashing her a smile. The two chat for a bit, and soon even Gadot's Justice League costars, Ben Affleck, Ezra Miller, and Jason Momoa are looking on in admiration. "Now we are friends so there's no reason to cry anymore," Gagot appears to be saying in the short clip. "We are together!" "You're a warrior," added Miller, 24, after hearing the exchange. "I think the ability to let yourself cry is what makes you such a warrior. Come join the Justice League whenever you get ready!" Ben Affleck, who confirmed during Saturday's Hall H panel that he will continue to reprise his role as Batman for the foreseeable future, also chimed in. "Sweet kid," the 44-year-old actor said. Gadot shared a fun selfie on Instagram on Saturday of the Justice League cast on their way to SDCC, with the caption "Ready or not here we come..."